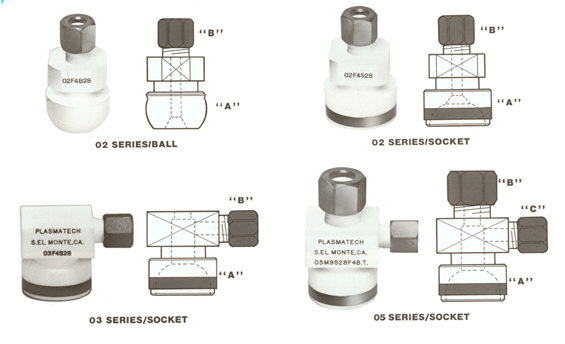 Plasmatech PTFE fittings for balljoint connections are precision machined from virgin PTFE. Fitting nuts are injection molded of Ryton R-4 and the retaining collar, used on the socket versions, is machined from aluminum tubing and anodized. All sizes and styles are designed for use with Thomas pinch-clamps or equivalent. Pinch Clamps for above are available from Plasmatech. = Socket or ball connection. Dimension is expressed in “mm” such as the large number of a balljoint designation (28/15 or 18/9). = Plasmatech tube fitting for tube O.D. as shown in “B” column. = Plasmatech tube fitting on branch connection for tube O.D. as shown in “C” column. 05 F6 S28 F4 B.T. 05 F4 S35 F4 B.T. 05 M6 S28 F4 B.T. 05 M9 S28 F4 B.T. 05 M10 S28 F4 B.T. 05 M12 S28 F4 B.T. 05 M9 S35 F4 B.T. 05 M10 S35 F4 B.T. 05 M12 S35 F4 B.T.